Dandelions just aren't very abundant where I live. So when I found this lone dandelion in the neighbor's yard, my nephew was the first to volunteer to help me make a photo. Don't you think he did a great job? Deb, this is lovely! 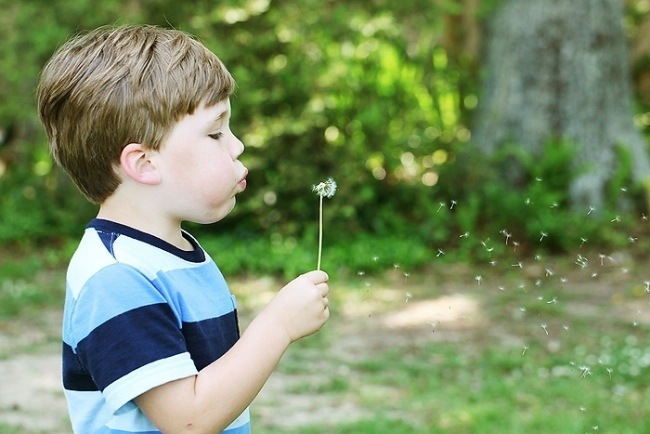 I love the way you have captured the dandelion blowing away! This is a great photo! I love how you managed to capture even the tiny seeds floating away. Thanks for your comment on my photo as well! Yes.. He was a great assistant! You rocked the photo. Dandelions are so whimsical.. I used them in my short for the challenge too! I looooove how you've captured them floating away so dreamily! Well done! A precious moment you'll have forever! I love how you can see the seeds flying! Great shot! Your nephew made for a great model...he kind of reminds me of the kid from Sleepless in Seattle. Oh, he definitely did a great job for you! Oh, I'm so glad you entered this one. I love it!! Aw, you have a wonderful model! Great shot! I love it so, so much. Adorable! And I'd be happy to share some of our dandelions. Although they do make for fun photos! Wow he really did. I can see all the little wishes floating. What a great shot!